Editor's Note: In March 2018, the Diocese of Buffalo released a list of 42 priests accused of abuse. 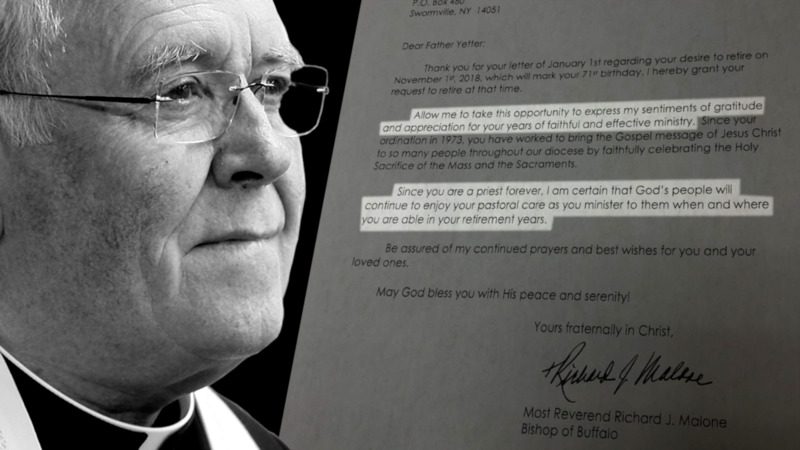 WKBW television station in Buffalo has learned that two priests who were in ministry at that time were originally considered for inclusion on that list, but were removed before the list was made public. This is the second part of a two-part investigative series on Bishop Richard J. Malone's handling of those priests. Kyle is a devout, faithful Catholic from Buffalo, New York. “I have a deep respect for the virtues of piety and obedience,” he said. Which is why it almost pains him to tell the story of Father Robert Yetter, the longtime pastor of St. Mary’s Catholic Church in Swormville. In 2013, Yetter offered Kyle what was supposed to be a helping hand. The young man was 25 and searching for answers in life when Yetter offered to take him to see “Captain Phillips” at the Walden Galleria cinema. The two planned to watch the movie and talk about faith over dinner at Jack Astor’s. “This was my first opportunity to be able to really ask him some deep questions about the faith so that I could get some answers for what I was searching for,” Kyle said. But then Kyle said something happened that he never expected. “We were like lightly laughing about something that was mildly funny and then he just kind of finished the laughter and then just like slaps his hand right here,” Kyle said, pointing to his inner thigh. His first reaction was to freeze. “You know, I'm this 25-year-old straight guy and never really been in this situation and I knew, if my own dad did that, I wouldn't be OK with it, let alone this priest who I sort of know,” he said. Yetter, according to Kyle, kept his hand there for 30 to 45 seconds. Instead of turning away from his faith, Kyle turned to it, becoming a leader in young adult ministry in the Diocese of Buffalo. After becoming a member of a faith community, Kyle finally found the strength to come forward in April 2017. Kyle wasn’t the only person who would come forward to report sexual advances by Yetter to the Diocese of Buffalo. Two other young men in 2017 and 2018 told the diocese they had *similar encounters* with the priest, according to the complaints filed with the diocese. But hundreds of internal records obtained by WKBW television station reporters show that Buffalo Bishop Richard J. Malone and those who work for him allowed Yetter to remain pastor of a large parish with little consequences for his actions. They also took steps to withhold this information from the public, a reporter found. Victim No. 2 is the second young man to allege misconduct by Yetter. He’s too embarrassed to give his name and WKBW has agreed to withhold his name and Kyle’s last name to protect their privacy. The incident took place in 2007, and church records obtained by WKBW show the victim said the priest “tried to kiss him again while using his hand to grab his pants zipper and genital area.” Another time, Yetter allegedly took him to the Seneca Niagara Casino, offered him alcohol and started “kissing his neck…then pushed him onto a chair” before he was able to get away. The victim said two of his other friends had similar experiences with the priest. The diocese does not appear to have tracked them down. According to internal memos obtained by WKBW, Yetter admitted to the touching in the movie theater but said he didn’t remember the incident in the casino. Grosz’s solution was to give Yetter, who is in his 70s, a lecture on sexual harassment. Memos show he referred Yetter for counseling at the Diocesan Counseling Center, which is run by another priest. In both cases, Grosz also reviewed the file with Lawlor Quinlan who, along with Terry Connors, does legal work for the church. Soon after the allegations and after reviewing the files with Quinlan, Grosz used his typewriter to write that the cases were “considered closed.” He then put his handwritten initials on the documents. By the first day of 2018, Yetter was planning the terms of his retirement, including a trip to Venice, Italy. He told Malone he planned to serve as pastor at St. Mary’s until November 2018, and the bishop heaped praise on the twice-accused priest. But the very next month, another complaint was sent to the diocese, written by a third victim – who chose to remain anonymous. It does not appear the diocese was able to identify the victim. One month later, the clergy sexual abuse crisis in the Diocese of Buffalo exploded with revelations that church leaders covered up massive abuse in the diocese. To date, 82 Buffalo priests have been accused of sexual misconduct. Church sources told WKBW that both Yetter and Fr. Art Smith were being considered for inclusion on the diocese’s list of credibly accused priests. But the diocese removed them before releasing the final version — which did not sit well with Kyle. One possibility is that the church treats cases like Kyle’s and that of Victim No. 2 differently than others, because they were over 18 years old and therefore do not technically fall under the Charter for the Protection of Young People — a governing document created by American bishops in 2002 to deal with widespread clergy sexual abuse. The “zero tolerance” rules bishops wrote back then do not apply to anyone over the age of 18. In Buffalo, these cases are handled by the Diocesan Review Board, a group of mostly lay Catholics who are appointed by the diocese. “Even though it was by another man who made a vow to God who's 50 years older than me...that doesn't have to be reported apparently,” Kyle said. According to the diocesan website, members of the review board include Alfred F. Luhr, III, a vice president at M&T Bank; Rocco J. Diina, a former Buffalo Police Commissioner; Maria J. Picone, coordinator of special projects at Catholic Charities; Patricia W. Collard, a registered nurse; Sister Anne Marie Jablonicky, a Franciscan sister; Roderick Quebral, an attorney and former prosecutor; and Msgr. W. Jerome Sullivan, a priest. Church attorney Quinlan, in an email, gave Malone some insight into why that board didn’t give Yetter much of a punishment. “While Yetter’s conduct was certainly inappropriate, there was some concern that Fr. Yetter should not be treated more harshly than other priests who have been accused by adults of offensive or sexual contact,” Quinlan wrote. Malone visited Yetter at St. Mary’s of Swormville on June 3, celebrating Mass with the priest, posing for pictures and, according to a memo obtained by WKBW, bringing Kyle’s renewed concerns to Yetter. “Be assured of my ongoing prayers and best wishes for you and your priestly ministry,” Malone wrote. That may explain why our email to the diocese on July 5 asking whether there were any allegations against Yetter sent the bishop and his staff scrambling. Publicly, the diocese gave no response. The “assessment” refers to an evaluation the bishop suggested Yetter undergo ten months earlier. Church sources say no one ever followed up on the directive until we sent our email. In light of WKBW's questions, documents show Yetter moved up his retirement date from Nov. 1 to September 1, and Kyle will soon be able to attend Mass at St. Mary's again. He said he wasn't able to have his wedding at his childhood parish. Kyle met with Malone in June of this year and said the bishop told him that he was Yetter’s only victim. But official complaints received by the diocese show that at the time of that meeting, the diocese already had the complaints of Victim No. 2, as well as the third victim, who was anonymous, on file. Other documents show Malone was made aware of these complaints multiple times, including by a diocesan lawyer who gave him an update before that meeting. 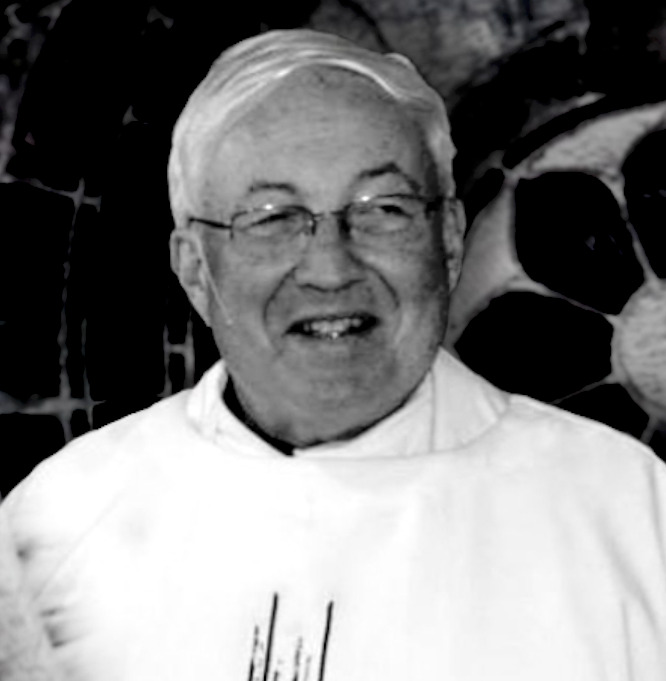 "The Diocese is unaware of any complaints of abuse of a minor by Robert Yetter. Complaints concerning adults are treated seriously and follow a different protocol." Yetter did not respond to multiple requests seeking comment for this story. UPDATE: Erie County District Attorney John J. Flynn Jr. spoke with WKBW as it prepared to publish this story. The district attorney said he plans to investigate the crimes described above and decide whether they fall within the statute of limitations. In that case, he could prosecute the priests or the diocese for their actions, he said. The first two pages of a Chancery Memo related to allegations against Father Yetter. It reads, "Father Yetter indicated that all that Kyle stated is true." Email between diocesean lawyer Lawlor Quinian and Bishop Malone which discusses "concern that Fr. Yetter should not be treated more harshly than other priests who have been accused by adults of offensive or sexual contact." The Diocesan Review Board (DRB) recommended Fr. Yetter "go for an assessment" in September 2017, five months after Kyle made a formal complaint with the diocese and two months after Victim No. 2 made a formal complaint. Letter from Bishop Malone taking Fr. Yetter for the "generous gift on behalf of your parish"